Over the summer, biologists from the California Academy of Sciences in San Francisco returned from an expedition to the Philippines with some very rare and diminutive guests, a mating pair of pygmy seahorses. The two tiny fish, each shorter than an inch and bright orange, were collected as part of a larger study of the stunning biodiversity found in the “Twilight Zone" of the ocean. It's a relatively unexplored environment located at depths where the bright tropical sunlight barely penetrates. Pygmy seahorses live their entire adult lives attached to a type of coral called a Gorgonian sea fan. The seahorses use their long tails to grab on to the delicately branched sea fans. But what’s really amazing is their ability to match the coral’s bright color and knobby texture. They blend in so perfectly that they are barely visible, even to a trained eye. More people have walked on the moon than have seen a juvenile land on a sea fan. Pygmy seahorses are nearly impossible to raise in captivity. More people have walked on the moon than have seen a juvenile land on a sea fan. Until recently, there was no record of the seahorses ever living long enough to breed in an aquarium. As a result, very little is known about them, making them extremely attractive to researchers eager to learn about the mysterious species. One of the biggest hurdles is keeping the host sea fans alive, since the pygmy sea horses cannot live without them. 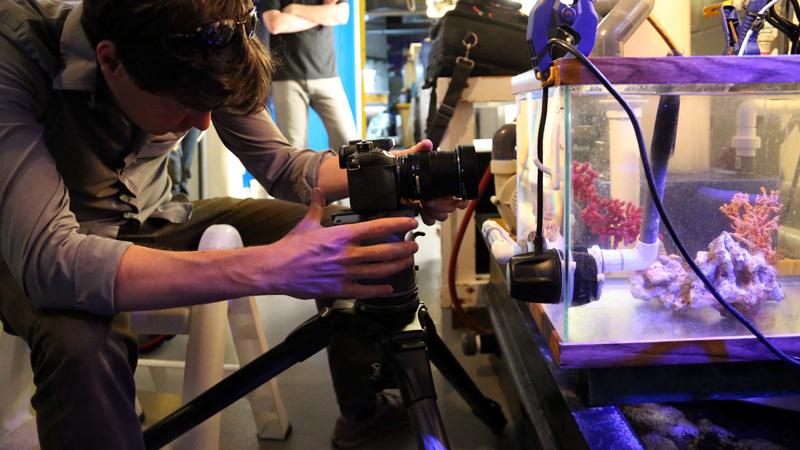 Biologists Matt Wandell and Rich Ross knew this would be tough, but they had been preparing since 2011 when Bart Shepherd, Director of the Steinhart Aquarium, issued them a challenge. They were tasked with keeping the sea fans alive for three years before they could even attempt bring back the seahorses. The Gorgonian sea fan is itself an animal, distantly related to jellyfish and anemones, and is very difficult to raise in tanks. But these seahorses cannot live without the them. So the team became experts in raising small sections of the brightly colored coral. They even came up with a custom-tailored mix to feed the sea fans, consisting of baby brine shrimp, copepods, and oyster reproductive organs. By 2014, the captive sea fans were thriving. 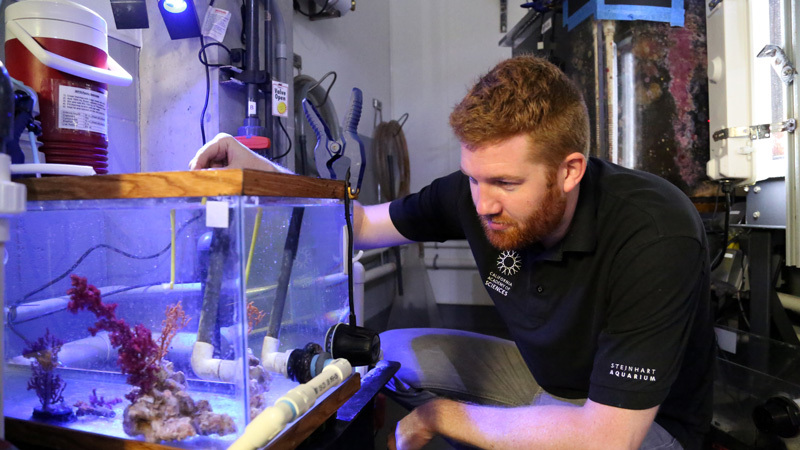 The team was ready to go back to the Philippines and bring back their treasured new tenants, a carefully selected mating pair of pygmy seahorses. Having located the species on a previous expedition, it took the group of divers, biologists and aquarists less than 36 hours to gently collect the pygmy seahorses and transport them to the other side of the world. From the bottom of the ocean, the seahorses would now spend their days in a small tank at the Steinhart Aquarium, housed within the California Academy of Sciences. The tiny travelers immediately made themselves at home grasping onto the long waiting sea fans. But then something amazing happened: the sea horses gave birth. Like other seahorses, it is the male pygmy that rears the offspring in his brood pouch, re-releasing groups of offspring every two weeks. Juvenile pygmy seahorses swim well and it is during this time that they venture away from the host sea fan to find new places to live. As they mature, they settle down and find a sea fan to call home. How exactly they find the sea fan has yet to be discovered. Over the course of several months, the Cal Academy biologists were searching for the answer to an elusive question: Are pygmy seahorses born certain colors, or do they change colors as they find sea fans of the same color? The answer, captured in this “Deep Look” video, may surprise you.